I’ve visited many places I thought qualified as the middle of nowhere. As a teenager, I thought my college town in western Kentucky was remote. A recent visit to Great Basin National Park in Baker, Nevada took me six miles off the “Loneliest Road in America.” And Big Bend National Park was all the way in southern Texas, on the Rio Grande and the US border with Mexico. 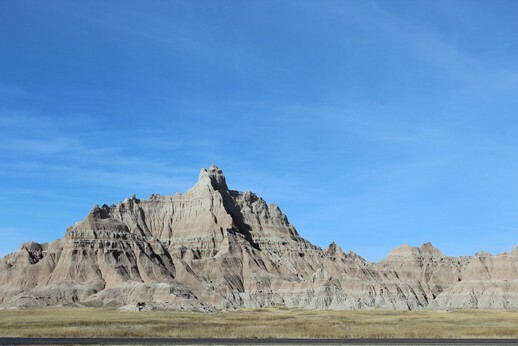 But nothing feels as remote as the Badlands, especially when you’re still 35 miles from Wall, South Dakota, and your gas tank light comes on. That was my harrowing experience earlier this month. I was essentially trying to get from Billings, Montana to Minneapolis, Minnesota, a trip that would be 800+ miles and take more than 13 hours. Not only is that too long of a drive for me these days, but I realized that Mount Rushmore and Badlands National Park are on the way. So I stayed in Wall for two days and explored the area. Wall, South Dakota is a small town with a large store. It’s home to Wall Drugs, a humble tourist draw with a restaurant, souvenir shops, and actual drug store. It sprawls over 76,000 square feet and famously offers free donuts to honeymooners, veterans, priests, hunters, truck drivers, or whomever else they fancy. I’m not sure if this is a constant list or if the signs change and they rotate who they favor, but it’s clever and fun. Wall Drugs started in 1931, before Mount Rushmore was finished. In the late 1930s, the owners stumbled on the idea of advertising free iced water on the interstate to travelers. It was an instant hit, supposedly, in the days before rest stops and air conditioning. So Wall Drugs is your stop on the long drive on I-90 through South Dakota. Get your iced water, a donut, check out the postcards, or grab lunch. Mount Rushmore National Monument is about 80 miles west of Wall, SD. You could stop there first, for the afternoon, as you’re heading east to Wall or use Wall as your hub, if you don’t mind the driving. I wasn’t initially sure how I would feel about Mount Rushmore. I wondered if it would be smaller than how I imagined, the way Graceland and the White House are. Or would it just be four faces in a “Man Mountain” as I started to call it? My feelings continue to be mixed, but each perspective is deepened with respect now that I’ve been. On the one hand, I came to appreciate the artistry, the magnitude of the effort, and the vision it took to scout out the landscape, envision the sculpture, and execute the vision. Mount Rushmore was completed under the direction of Gutzon Borglum and, eventually, his son, Lincoln, from 1927 to 1941. 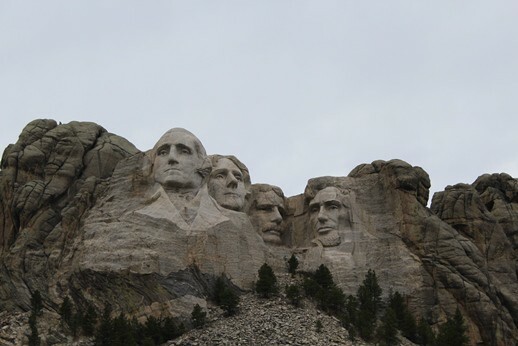 The 60-foot high granite faces depict presidents George Washington, Thomas Jefferson, Theodore Roosevelt, and Abraham Lincoln. I was most impressed with the details that really bring the mountain to life. The eyes of each President are alive and lively, as are their postures. The eyes come to life because the irises (if I’m getting my eye anatomy right) are carved out, deeply into the eyeball. Only the pupil projects out, giving each eye depth. The postures aren’t stiff or straight, either. The Borglums made clear decisions on the angles of the shoulders to give contrast to the position of each head. My favorite aspect of Mount Rushmore is that Teddy Roosevelt doesn’t actually have his signature reading glasses carved into the mountainside. Still, he’s recognizable because the hint of lenses is carved into his cheeks, just below his eyes. The optical illusion (is that a pun in this case?) is stunning. Some people even claim they can see the glasses! So I was thoroughly glad I learned more about the artistry and scale of Mount Rushmore. On the other hand, I wonder why we (humans? Americans?) need to regularly blast through mountains, for tunnels, coal, mining, roads, or even monuments to our leaders. What is this impulse? And our legacy? Will this monument outlast us? And what will it say about us? Further east, Badlands National Park is more aligned with how I would like us (humans, Americans) to be remembered: that we’ve taken our most amazing natural assets and preserved them for future generations to marvel at. 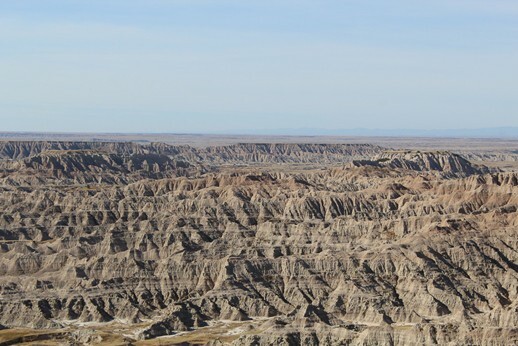 Badlands NP is an excellent example of this, since it’s such a dramatic, primitive landscape. Humans seem an unnatural addition to this environment, so I hope we can preserve these lands as a testament to how we, as humans, are just travelers on this planet for a small moment in time. Maybe I’m waxing poetic and stark because this is where I nearly ran out of gas and wondered what I would do in such a strange environment. You see, I forgot to gas up the car when leaving Wall. The problem is that I didn’t quite know where I was going. And even if I did, I didn’t know if there would be a gas station once I got there. I thought I was heading toward the Ben Reifel Visitor Center when my gas light came on. I hadn’t been paying attention and suddenly needed to do some quick calculations. If the Visitor Center had a gas station (doubtful), it would be tight, but I might be fine. If it didn’t, though, I was going to have to drive a long way back to the last gas station I remembered. When I saw a side road and a sign saying I was 35 miles from Wall, I pulled onto the road and stopped. I sat there thinking I was also 35 miles from where I came from. And who knew how many miles to the Visitor Center? In a comical moment of indecision, I turned around and turned left. I drove a few miles, then decided to turn around and head back. Then, no, I needed to head toward Wall. After three or four U-turns, I stopped the car a second time and tried to pull myself together. I did not want to walk and try to hitch a ride in this climate! Finally, I decided to head back toward Rapid City. I drove and drove and drove, sweating bullets until I rolled into a gas station on, I assume, just fumes and a prayer. I survived, as did my car. 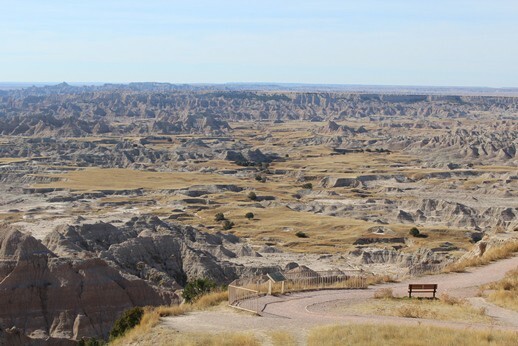 With a full tank, I headed back into Badlands National Park. This park is phenomenal and feels like a combination of several other stunning National Parks , including the Grand Canyon and Bryce Canyon, with some curiously placed grasslands or prairies as well. At one pull-off, I walked down to the edge of a cliff and sat on a bench. I then tried to imagine being an explorer or settler in early American times. How would I feel if I stumbled onto this landscape? Maybe that’s where the name comes from! But what would I do? If there were a lot of people in my party, I’d send scouts to find a way through or maybe north or south to get around. But I’ve had these thoughts at the Grand Canyon and Bryce as well and each of these imaginations makes me grateful for the explorers who ventured west and persevered. Because I was in the area for just a few short days, I didn’t hike much. I explored the Visitor Centers, did the scenic drives, took photos, and contemplated the contrast between Mount Rushmore and Badlands National park. I’m glad I took this southern route to Minneapolis. Man-made or Earth-made, these National Park System sites expanded my sense of the possible. And I won’t let the gas tank get that low again! A legacy, in South Dakota, is a feisty & independent woman named Madam Dora DuFran (born Amy Helen Bolshaw), whose plot in the Mount Moriah Cemetery is located near Wild Bill Hickok and Calamity Jane, (two people Dora knew very well.) The legacy of this lady is that not only was she a famous brothel Madam in Deadwood, but Dora is also my maternal 3rd Great Aunt. I actually wrote my BA thesis on her life, while studying at Goddard College. And I believe you’ve heard of that college as well ? Parts of Dora’s life are gone and will be forgotten, and yet others (like her cemetery stone for her pet parrot Fred – named after her brother, my Great Great Grandfather Frederick), will live on. I suppose legacies are what people choose to remember; certain people choose to preserve those particular items or chisel stone to remember those that came before. For some it will have great meaning and for others it will be a Wild West lady who they’ll forget as soon as they leave. Legacies are personal and very subjective. But you know, such is life! Thanks for sharing the story of Madam DuFran (AND her parrot! ), Kathryn!